Goga is an amazing vocalist and musician that can perform a wide variety of genres , from opera to rock. 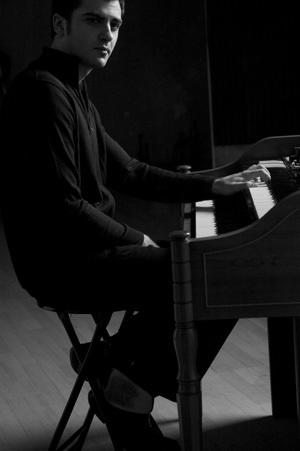 He studied classical piano since the age of 7, played the guitar for more than 15 years. And most of all Goga's unique baritone voice is his identifiable trademark. If you heard him before , there's no mistaking it, you will recognize his voice out of thousands. Goga's enthusiasm on stage is contageous. You feel that he has fun performing, and the passion that he puts into every phrase of every song makes his shows a special experience. Goga earned his name through covering the music of others with his own twist, especially songs from Michael Buble and Andrea Bocelli. But Goga is equally respected composer and songwriter. His recent songs are stories about his life struggles, love, and getting older. Goga's original music finds inspirations from contemporary rock artists like Matt Kearney, Young the Giant, and One republic. appealing to the adult contemporary listeners. you can find his latest 2 singles on amazon mp3 and itunes. "Crazy Love - Goga" "Feel Alive - Goga"
Notable activities include opening for Earth Wind and Fire Band for a private event in Houston TX. Opening for Cindy Lauper at a private fundraiser in Dallas, TX. Goga performs on a regular basis at premier places around Dallas Texas , and Los Angeles, CA. such as the the Mansion On Turtle Creek, Montage Hotel in Beverly Hills, Hotel Zaza, Ocean Prime, the Joule Hotel , and many more. Goga has over a decade experience at entertaining on Weddings, Corporate events, Hotel Lounges, and Outdoor Venues. Repertoire of the artist is very broad covering many popular styles like Jazz/ Country/ Alternative / Easy Listening / Classical / Pop/ Top 40 find it here.